Turkish President Recep Tayyip Erdogan demanded Saturday that Saudi Arabia extradite suspects in the killing in Istanbul of journalist Jamal Khashoggi, taking to task the kingdom’s crown prince who was basking in his quick return to the world stage at the G20. Crown Prince Mohammed bin Salman’s presence at the summit of the Group of 20 powers in Buenos Aires demonstrated he was firmly in control, as he met with Western leaders and sealed an oil pact with Russian President Vladimir Putin. But the Turkish leader, also attending the G20, was visibly cooler toward the 33-year-old prince and on Saturday directly criticized him for the first time over the killing of Khashoggi, a royal confidant turned critic. Saudi Arabia has said that 21 people are in custody and vowed to keep probing the killing of Khashoggi, who was killed and dismembered after visiting the kingdom’s Istanbul consulate to handle paperwork for his planned wedding. 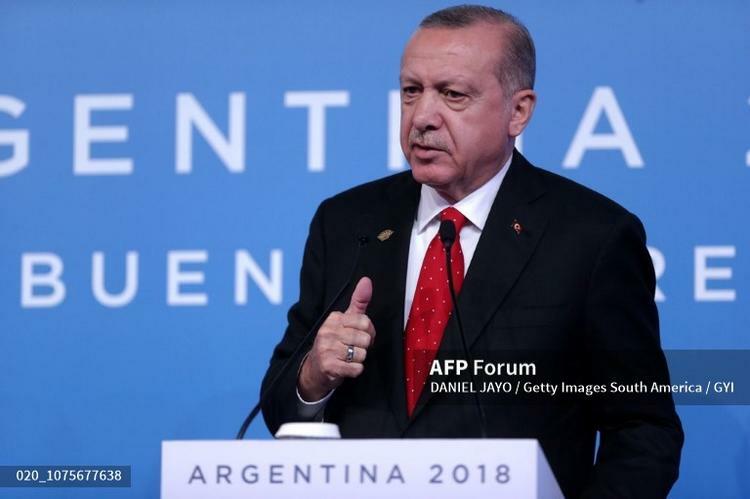 “It’s essential that these people are tried in Turkey in order to eliminate any question marks that the international community may have,” Erdogan told reporters in Buenos Aires. Erdogan said the Saudis have refused to help Turkish prosecutors with information on the whereabouts of Khashoggi’s body and the identities of accomplices said to have supported the visiting Saudi hit squad. The Islamist-oriented Turkish leader, who has been vying for influence in the region with Saudi Arabia, said he did “not wish to cause any damage” to the royal family. But he criticized Prince Mohammed, saying that during the summit the Saudi heir apparent gave an “unbelievable explanation” on Khashoggi’s killing. The prince told world leaders that “unless the crime is proven, you cannot blame Saudi Arabia,” Erdogan quoted him as saying. Erdogan said that only one G20 leader — Canadian Prime Minister Justin Trudeau — raised the journalist’s killing in the full summit. Erdogan said that he himself did not bring up the case as time ran out in the session. Canada has been outspoken on human rights in Saudi Arabia, which has retaliated by breaking off diplomatic relations and vowing to end trade. But US President Donald Trump has said that it does not matter if the crown prince ordered the killing of Khashoggi, who lived near Washington, because the kingdom is a major buyer of arms, supplier of oil and opponent of Iran. In a nod to growing criticism at home on Saudi Arabia, Trump only exchanged “pleasantries” with the crown prince, according to the White House. But Secretary of State Mike Pompeo met with his Saudi counterpart in Buenos Aires, and again defended the US embrace of the crown prince. “There’s no direct evidence linking him to the murder of Jamal Khashoggi,” Pompeo told CNN. Several US news reports say that the CIA has concluded that the crown prince ordered the killing, even if there is no “smoking gun” evidence. The Wall Street Journal, quoting the CIA assessment, said Saturday that Prince Mohammed sent at least 11 messages in the hours before the killing to a close adviser charged with overseeing the murder. The crown prince enjoyed a buoyant welcome at the G20 on Friday from Putin, the two exchanging a high-five and grinning broadly as if they were long-lost friends. Putin said he had agreed with Prince Mohammed to renew a pact on cutting oil production by their two nations, the world’s leading exporters of crude. Analysts had been touting a Russia-Saudi deal ahead of talks next week in Vienna of the OPEC oil cartel, as global crude prices have been slumping.